Summer is finally here! It’s the season of outdoor adventures, and for many people, that means spending time at a campsite. Did you know you can make your camping experience better (and easier!) this summer with some Honda accessories? 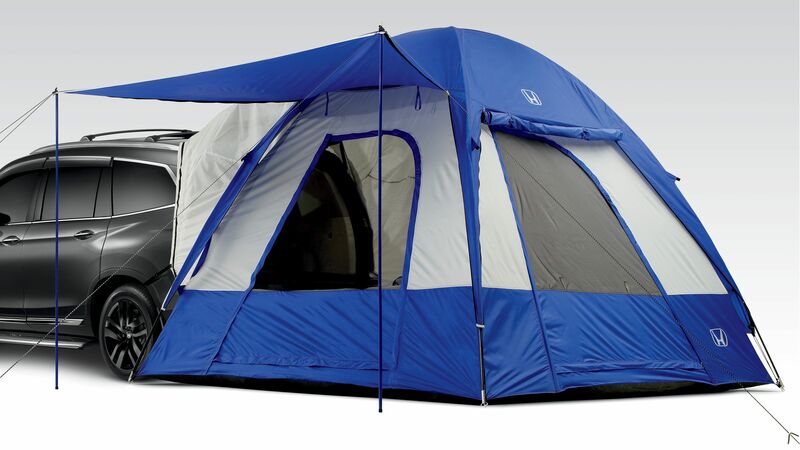 Get the most out of your camping space interior by finding a tent that can attach to your hatchback for extra storage. You may want to keep some of your belongings inside, without losing valuable sleeping space. Having a tent that attaches to your vehicle allows for the easy access you would get by storing things inside the tent without losing out on space. With the tent attached to your vehicle, you have the option of keeping your belongings inside the vehicle and sleep in the tent, or the more popular route – setting up your air mattress in your vehicle with the rear seats folded down and sleeping off of the ground. Whichever configuration, you will have ample space for sleeping and to store camping necessities. Depending on how long you plan to be camping for, you may need to pack a number of things. If you’re looking to expand the amount of cargo space available to you, invest in a Honda Roof Rack Box. The box is available in short and medium, lengths, and are designed to be durable and keep your belongings inside safe from damage. The short box is capable of holding up to 100 lbs, with the medium box capable of holding up to 110 lbs. If you are a more active camper, you may want to bring a bicycle with you on your trip. Bicycles can take up a lot of room inside the vehicle, as they typically don’t fit perfectly and it can be difficult to pack around them without damaging the bike. With the Honda Roof Rack and Crossbars, you can also get a bicycle attachment to bring yours with you on the roof of the vehicle. If you have a trailer hitch, you can also invest in bicycle attachments that fit on the hitch at the back of the vehicle – keeping the roof rack free for extra cargo space. For more information on Honda accessories that will help you get the most use out of your Honda vehicle this summer, visit us at Henley Honda today.